Jandal Criollo Cattle Company produces high-quality Registered Criollo Cattle. 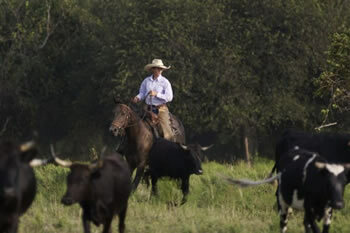 We are the original seedstock producers for the American Criollo Beef Association. Each and every one of our Criollo Cattle are DNA tested for tenderness and quality You can read about the DNA testing here. Whether you are looking for a profitable way to raise cattle, a small "hobby herd" to keep your ag exemption, or just want to raise your own delicious beef, there is no better choice than Criollo Cattle from the Jandal Criollo Cattle Company. Our cattle are easy calving, easy breeding, easy keeping, and just plain fun to work with! Please browse our website and learn a little about what we call the world's best breed of cattle!